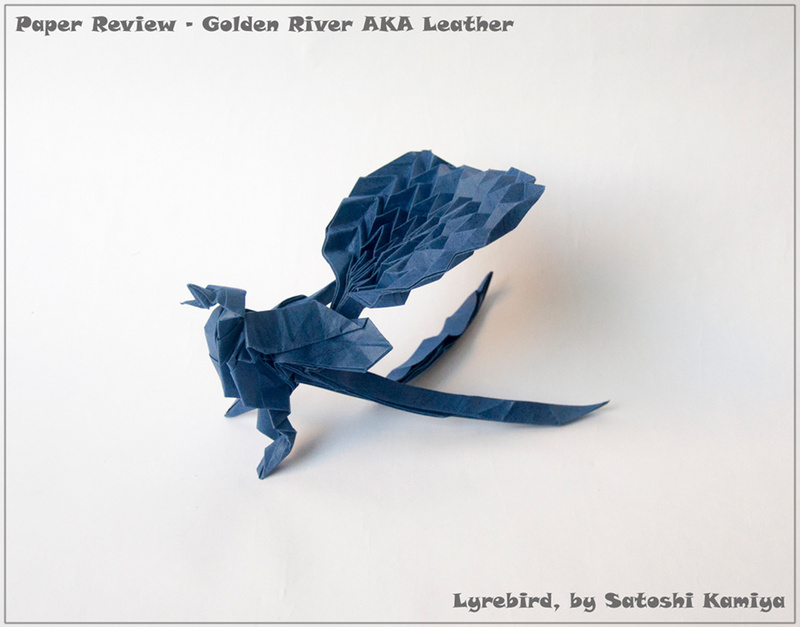 This is the third Japanese paper we reviewed. 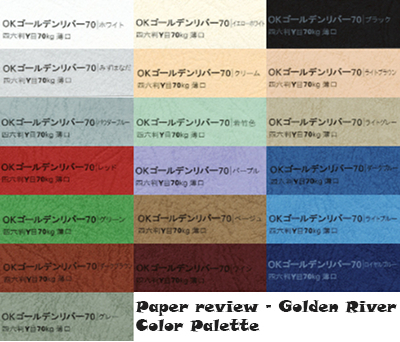 Just like the first two Japanese papers we reviewed (Karaperapisu and Biotope), Golden River (ｺﾞｰﾙﾃﾞﾝﾘﾊﾞｰ) is distributed by Takeo and packaged by Toyo. As before, we were not able to find official data on the paper. So we had to complete this review based on the laboratory tests and our own hands-on experience. I met this paper in Italy, and it was called Leather; not because how it felt, but mostly because of the look. There is a unique texture that does remind you of animal hide. I met it again in Takeo store, in Tokyo, and later in Nicolas Terry Origami – shop. Thickness: The paper weighs 81gsm and has a thickness of 115 microns. For comparison, Tant has the same weight, but is 10% thicker. Sizes: Not all sizes are available in all stores, but you can find full sheets at 109.1cm × 78.8cm, as well as pre-cut squares with a side length of 70cm, 35cm, 24cm, 23cm or 15cm. Colors: Takeo produces 19 different colors. 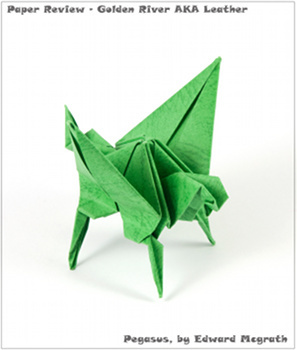 origami-shop.com sells 10 shades: brown, light brown, green, red, gray, blue, red wine, beige, white, and ocher. Paper Coloring or Colorability: The paper curled just a little when applying acrylic paint. No color seeped to the other side. A 175mm sheet expanded by 1mm lengthwise. While the paper is suitable for coloring, it loses its unique texture in the process. Texture: In my opinion this is one of the best features of this paper! It is leather-like; skin-like. One side is embossed with long, random grooves. It is a bit rough to the touch and has a matt finish. The reverse is flat and smooth. The paper is almost completely opaque and the color, while solid, isn't even: you can see the grain direction. Photogenic: The matt finish and the textured surface provide are a very good starting point. Use your light smartly and you can make great images. It is worth noting that the texture particularly of the lighter shades tends to disappear in shots. Aging and Wear and Tear: This paper scores averagely, just like Biotope in our last review. Golden River scored 400 with the grain and 504 against the grain in the tearing machine. During folding, we did have some problems with the paper tearing. 7 out of 10. Memory: The paper has an extremely good memory. Creases, when sharpened, tend to stay still and the paper jumps into place when changing from a preliminary fold to a waterbomb base, staying relatively flat. 9 out of 10. Forgiveness: Reversing a fold is done effortlessly. 9.5 out of 10. Tensile Strength: We refer here to the maximum stress the paper can undergo while being stretched or pulled. In our tests, Golden River was about 50% better than Biotope, which is surprising. It can hold 9.7 kg before snapping, stretching by 4.4 cm (20% less than Biotope). 8 out of 10. Bending Resistance: This section rates the amount of force you need to apply to get a sharp crease and how strong the paper is while being curved. The results, 116 and 50, are double of Biotope. 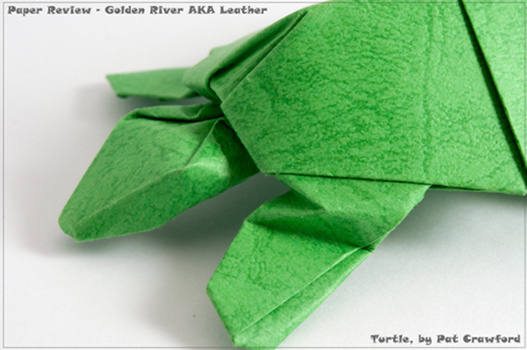 In comparison to the other papers we tested, Golden River scored average. 7.5 out of 10. Price group: Moderate - fine folding - for showing in a monthly meeting. The texture is fine enough to still be visible. While folding the grid, you can feel how sturdy the paper is. There's a major difference between folding with or against the grain: when breaking the fibers it feels much stiffer. Reversing the fold lines is done effortlessly in both directions, although it is much better when you go against the grain. The precreasing continues to be a joy on the diagonal folds, as they find their way to the corners without any problems. Both of the phases of the collapse go quickly and easily. The paper literally jumps into place. The final model looks interesting: the texture is visible and adds to the model's charm. The paper is too thick for complex models. This is a box-pleating model and the paper is highly suitable for that. Creasing through two, four, or even more layers at once leaves good crease marks on all layers, which makes it easy to sink back and forth as required. The paper is very snappy, jumping into place. In step 55 you need to fold 30 layers at once. It's doable, but not comfortably. From here on, I was disappointed by the paper's performance. The paper is much too thick to add all the details. I couldn't shape the legs, the head, and in particular the tail. It is a corrugation, smartly used as feathers, but with that many layers, I could not crease it as shown. I had to open the model and make all pre-creases one by one, while the paper was flat. The final model looks clumsy, not even close to as delicate as it should be. The paper has a good thickness for modulars. Golden River is a great choice for simple folds. I made the six units without any problem. Puffing the petals showed this paper has a lot of tension and can be stretched without crumpling. The weakness on the veins of the leather texture are a minor weakness: if a crease runs just along it, it may be hard to place the crease correctly, rather than on the vein. Assembly is fun. The tabs are stiff, and the final model is highly stable. Coloring the paper changed its proportions only slightly. I colored the paper with grey FolkArt acrylic paint. This changes the paper's behavior a little. To be more specific, it resists shaping a bit more. While this paper is not thin, it is not too thick to pose real problems, even with the ears. While shaping, it is easy to give the body volume and to achieve a rabbit that stands stably. 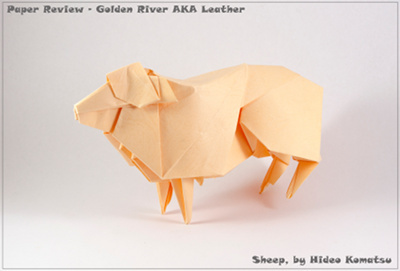 Golden River is great for models of lower complexity. This is the first model I folded with Golden River. Truly, this first fold tells almost the complete story of this paper. The creases are sharp, strong and crisp. Accumulating layers shows a shortcoming: the layers won't lay flat. Step 36 asks for reversing the left side, and in sharp corners the paper resists this manoeuvre. Quickly, this turns out to be the paper's main issue: it is too thick to allow easy shaping of the legs, or to sink some layers together. On the other hand, it is an advantage when you lock the sides of the sheep together: it holds strongly. The paper is great for simple 3D models. Many layers can be a problem, but not with this pegasus. I first tried to fold a complex Centaur. I couldn't finish it, although I used a 35cm square. There was no way I could have shaped the fingers or the other small details. So I changed my models to more simple ones. With these intermediate models, I found the paper easy to fold and shape. 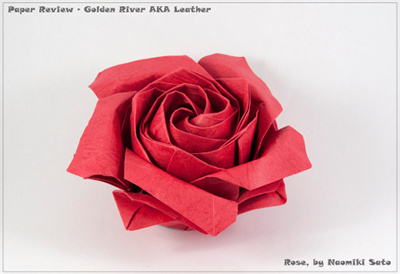 You can fold many layers with it, as the paper is relatively thin, but you have to be careful not to tear it. For me, the paper tore once on a crease line. It seems the fold lines reduce the paper's durability. A great color and texture for this rose! At the age of fourteen, Ynon Toledano is our special third opinion reviewer. Ynon found the paper to be strong and durable. There was no need to add MC. Golden River is slightly too thick to be suitable for complex, but for this rose, without many overlapping layers, it was good. Folds are sharp, although a little difficult to reverse. Shaping the petals was easy and the result was satisfying. 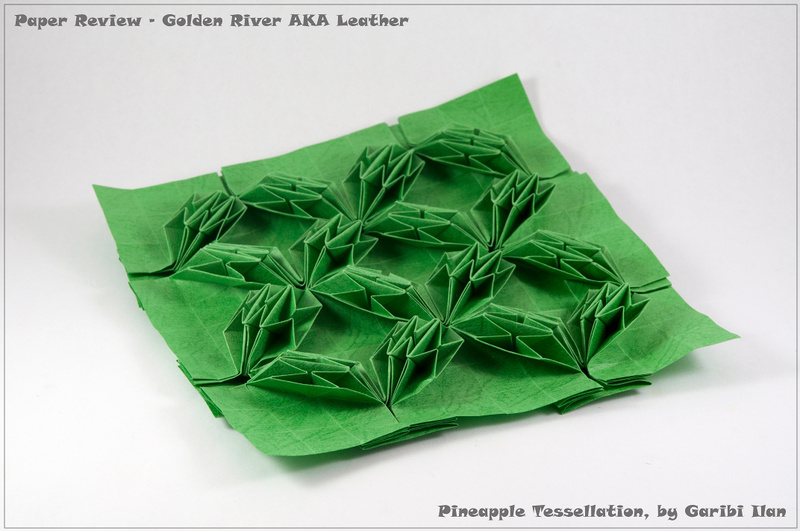 With 80gsm, this paper is in-between: too thin for tessellations, too thick for complex. But its great texture, the unique look you can get with it and the way it can be shaped to will, it is a wonderful choice for 3D animals and modulars. Especially models without multiple layer or tiny fingers will benefit most from it. 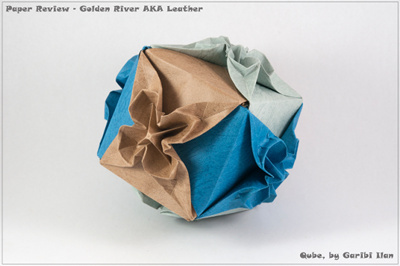 In flickr, it is usually referred to as Leather, rather than Golden River. I found only 21 pictures, mostly of animals, plus some fractal stars. 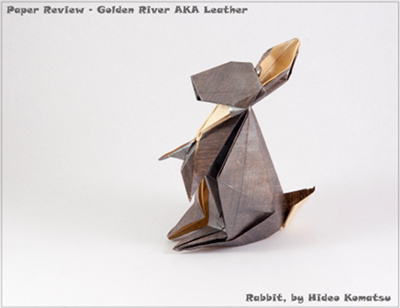 Golden River's texture is its main selling point, but not its only one. Its midway thickness is a good compromise that allows both shaping and accumulating a few layers without a real problem.